Nothing much happened this week. I was occupied with the students' grades. No teaching, but I was fixed with my not-so-favorite things to do, identifying deficiencies and checking papers. But I guess the highlight of the entire week is the unexpected freelance work. The work is quite outside my comfort zone. Hence, part of me is nervous about everything. I'm nervous to the extent that my arms feel weak while I'm typing this post. Client is a big time boss so all the more I feel pressured. If this becomes successful, this might start another steady source of freelance works. Hopefully, I will not mess up and make things happen. Since, I'm quite busy over this long weekend, I have to apologize for this short and literally sweet Sunday post. I'm trying out everything at the workplace's cafe. For those who can remember, I posted the same slice of Sansrival last Sunday. I like that they converted to the buttery icing but the sweetness of the entire slice is too exaggerated for my taste buds. 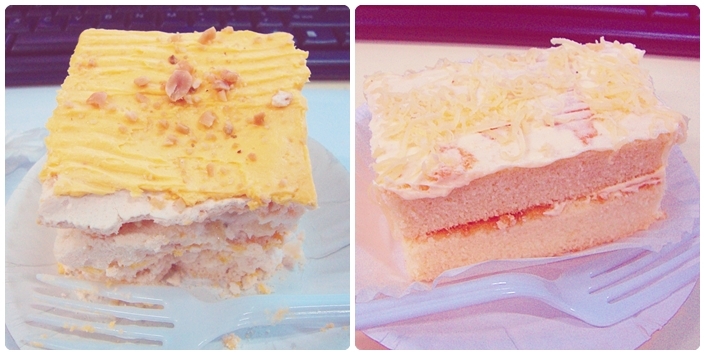 The few good things I appreciate from the workplace's cafe is the glass of housblend iced tea and banoffee pie. I think I had two of these for the week and I can feel the consequences. I feel so bloated and that translates to additional lines in the weighing scale. Meet my Saturday night companions! I was already starting my freelance work. As much as I wanted to sleep, I can achieve my writing groove whenever everyone is quiet and asleep. Pinipig crunch for the win! Vanilla ice cream covered with crunchy chocolate and rice krispies to keep me awake. Thank you sweet Diane for the cool party! Have a blessed Sunday. Sounds like another busy week for you. I think that banofee pie looks delicious! Happy Sunday my friend and namemate! Sweet hugs! Good luck with your freelance work, Diane. The ice cream looks so yummy!